And General Motors is not a person. Well, they weren't for 150 years of our history, until the Supreme Court ruled they were...reversing years of cases and precedents. In a case known as Citizens United (for one of the parties) the court held that corporations are to be considered as a "person" under the law so far as political speech and activity is concerned; meaning they can NOT be regulated as far as contributions to candidates and parties are concerned, nor in their support for them in other ways...just as you and I. Out the window went decades of meager attempts to regulate campaign spending. The doors to corporate Fort Knoxes are open and the possibilities of influencing, even outright buying, of candidates and office are incredible. What couldn't be accomplished by regulation, because the parties in Congress often deadlocked on proposed regulation--each seeking whatever advantage for its side they could, is accomplished by one vote on the UN-elected high court. This fall we will probably see an incredible amount of money spent on all sides, with more TV ads than ever (thank you Supreme Court! ), and with secret attempts to buy races. I say secret because there has been no corresponding attempt for openness. Donations are hidden under lofty sounding names of PACs (political action committees), many contributions now do not have to be made public, a weak Federal Election Commission can't police what little they have to police, one major agency to assist them hasn't been named (in over 2 years since it was authorized), and one of the strongest voices in Congress for full disclosure of contributions, etc--our own "Mitch" has been strangely silent since the Citizens United decision. Maybe, if things get as bad this fall as I suspect they may, we citizens can unite to get some changes in the next Congress (assuming all that money hasn't bought an even more subservient group) or even in the Supreme Court (the same group that issued the Dred Scott decision the "separate but equal" decision, said women could legally be paid less than men for the same work,etc. etc. etc.) --You are out of step with the ideals of American Democracy, and it's time for a change. I continued to believe that coal is important to Kentucky, and not just for the jobs it provides and the low power rates for your home and mine. I believe it can be made clean and this is important to America's future---even tho I don't see much actual work to make it cleaner by the industry that touts "clean coal" while at the same time fighting EPA anti-pollution and clean stream rules. What bothers me much more is the way coal gets away with not paying fines, when it admits safety violations that maim and kill--and the failure of Congress and our General Assembly from doing much about this. The latest, egregious case(s), one more in a long, long series of nose-thumbing by coal operators, was reported this week by the Courier-Journal. Even tho Kentucky Darby's #1 mine in Harlan County was found guilty of safety violations that KILLED 5 miners, and even tho it admitted liability for UNPAID fines and interest on those violations, the US has yet to collect nearly $700,000 from the explosion which happened nearly SIX years ago. Worse, a former top official of the Darby Mine is mining coal at 2 other Harlan mines which have wracked up another $637,000 in UNPAID fines for nearly FOUR HUNDRED safety violations. Federal agencies have said they prefer to get the fines thru civil action in the courts--at additional cost to you and me. Others, myself included, prefer a proposed law allowing the US to shut down mines that don't pay after a certain time. (That'll get their attention!) No pay, no mining. But the C-J reports it's stalled in, guess where?---Congress. I hope the Kentucky delegation will support this law..they won't be "anti-coal" if they do..tho they will be called that. They will be "pro-safety" and "pro-the rule of law." And even "pro-widows and orphans." The five dead miners in the Darby blast had both. But Kentucky should follow suit. Various mine operators owe the state fines and interest for unpaid safety violations, too. Kentucky should have a law allowing it to close such mines until fines are paid. Safety, the rule of law, and common sense all support such a rule. And it isn't "anti-coal" to be for it. 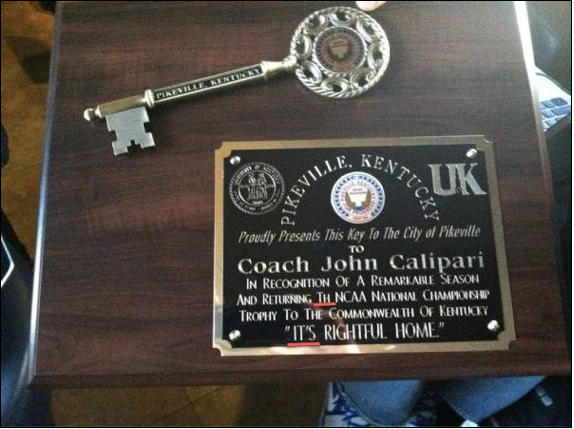 UPDATE: By midweek the Herald-Leader had tracked down the Pikeville city manager who said he had authored the plaque's wording, and that it was an innocent mistake; especially since he wrote "its" and the computer software changed it to the incorrect "it's." Well, we all know haste makes waste, although how an engraver can leave out an "e" on "the" and NOT catch it is beyond me. As to the computer software screwing up, boy do I believe that. I don't trust "spel checkur" at all, having seen too many "historic sights" and "scenic sites". among many others. What we are all scared of is a national reaction which typically goes something like this: "those ignorant hillbillies are at it again"--and well we might. First word I got of this was last Friday when a former staffer of mine, now retired in another state, spotted it on an obscure website neither of us had ever heard of. And for 3-4 days all local media, so far as I know, ignored the story--or worse, didn't catch the mistakes!. If they were really concerned about the national reaction, they would have tried to head it off as soon as possible. They didn't. So now, in my humble opinion, "its" going to keep coming back to haunt us, just as "th" Hatfield-McCoy feud does. Are we happy the Cats won the SEC? Are we pleased they made the Final Four? Let's Celebrate--chuck a couple of beer bottles at the cops! Are we delirious they're the new National Champions? Let's Celebrate..burn a house or garage or car! 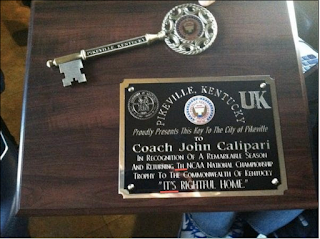 This is not celebration; this is not letting our team know how great we think they are--Brow and Jones & MKG and Teague are probably cringing at the national news coverage of how some UK students celebrated their victory--this is not just dumb, this is beyond stupidity--casting a shadow on all UK students, the school, Lexington & Kentucky, and, on one of the greatest teams in UK history. Needlessly, because there are many ways to celebrate that don't include destroying property and injuring innocent people. As for the guy who said "we won, houses should burn", OK, what's your address? We'll be right over! That's entirely logical, and also beyond stupidity. And this is the guy that I am paying taxes to educate? A future leader of the Commonwealth? Jail bird, more likely. At the very minimum he, and all those convicted of setting fire to property, overturning cars, injuring police and firemen should be brought up on whatever appropriate charges there are before the designated UK body--in addition to what the courts decide. And yes, expulsion should be considered. Because, if we don't get a handle on this now, what sort of beyond stupid "celebration" will we have when UK ties and exceeds the UCLA record? Our governor sent the legislature a budget he called "inadequate" for Kentucky's needs, but all he felt he could do under today's financial straits. 60 days later the legislature sent it back to him for signing, still "inadequate", maybe even "ugly." Part of this situation will continue until the economy gets better--but, when it does, our legislators have been known to go hog-wild, spending not wisely but too well. Part of the problem is what they call "structural imbalance", part is due to our antiquated tax structure; and while some say a few steps were taken to address the first, nothing was done about the second, except one more commission named to study the problem and report. In short, as too often happens, things were "put off", especially a basic need to revamp the way our election districts are revised. It is, after all, an election year..when legislators sweep issues, problems under any convenient rug, including yours and mine. Lift that rug, shake it out in the sunshine of this election year; remember what was NOT done, and hold their feet to the fire with your primary and general election vote, and your questions and comments to them in forums and individual meetings. That's the way democracy is supposed to work, but too often doesn't. Only you can change that.